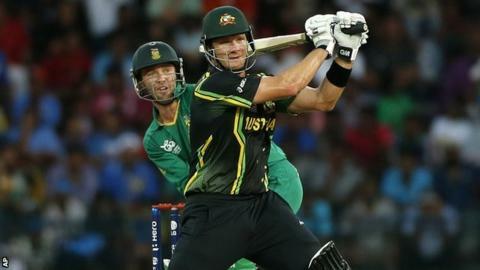 Shane Watson's incredible displays at the World Twenty20 continued as he inspired Australia to a resounding eight-wicket win over South Africa to effectively seal a semi-final spot. He took two wickets and spinner Xavier Doherty claimed 3-20 as South Africa posted a modest 145-6 in Colombo. Watson then bludgeoned 70 off 47 balls and Mike Hussey 45 not out as Australia marched to their target in 17.4 overs. Watson tops the tournament run-scoring, wicket-taking and six-hitting charts. "It's nice when things are able to come together consistently," Watson told BBC Sport. "At the start of this tournament I knew how important it was for us as a Twenty 20 team - and how important my role is in the team - to really try to set a platform with the bat. "It's nice things are working out at the moment, you just hope it can continue, especially towards the latter part of the tournament." Watson's fourth man-of-the-match performance in as many games puts Australia on the brink of the last four ahead of Tuesday's final round of Super Eight matches. Only a monumental defeat by Pakistan - well-beaten by India on Sunday - could see them miss out. On a slow track in Colombo, Australia were once again indebted to Watson, who wrestled the initiative back in favour of his team just as South Africa were threatening to get on top. On Tuesday, Australia play Pakistan before India play South Africa. IF AUSTRALIA WIN- Aussies are through with maximum points, India will join them if they win (by any margin). If South Africa beat India then SA, India and Pakistan will all be on two points and it goes down to net run rate. IF PAKISTAN WIN - Australia and Pakistan will both be on four points, and South Africa are eliminated. If South Africa beat India then Australia and Pakistan go through. But if India beat South Africa, then Australia, Pakistan and India will all be on four points and the top two will go through on net run rate. The Proteas scored 54 runs in the last five overs of their innings to reach a respectable score and reduced the Australians to 10-1 in the fourth over of their reply after David Warner was bowled by Morne Morkel. Watson struck the first ball of the next over to the boundary and suddenly the floodgates opened as Morkel's following over was milked for 15 runs. Spinner Robin Peterson and Wayne Parnell leaked runs as Watson and Hussey took control of the match by scoring off almost every ball and putting away anything wayward with conviction. Watson brought up his third fifty of the tournament - his other score was an unbeaten 41 - with a six over deep square leg and had taken Australia to within 38 of their target when he was caught at long-on off Peterson. Hussey and Cameron White made light work of the remaining runs with White finishing off the match by smashing Johan Botha for six. "We didn't score enough runs, and we didn't bowl well enough," said Proteas skipper AB De Villiers. "Shane Watson is in a rare vein of form that even the best players only get in every so often. He is in a period where he just doesn't get out. The only thing you can do is get him off strike. At the halfway point I wouldn't have thought they would come out and knock those runs off so easily but that was such a dominant display." "We were all round pretty much beaten today. It's disappointing and frustrating and I'm scratching my head about exactly where it went wrong. One thing's for sure is we gave it our best and it just didn't click tonight." After winning the toss and choosing to field, Doherty marked his first appearance of the tournament with an early double strike. He bowled Richard Levi with the third ball of the match and induced an edge behind from Jacques Kallis to leave South Africa on 8-2. Wickets continued to tumble to deny South Africa momentum, with Watson snaring Hashim Amla (17) and De Villiers (21) either side of Doherty's removal of JP Duminy for 30. At 86-5 in the 15th over, South Africa were going nowhere, but Peterson seized the initiative with a confident and innovative knock. There were switch-hits, scoops and some lusty drives as he smashed 32 off 19 balls in a partnership of 60 with Farhaan Behardien, who finished 31 not out. Their late assault gave South Africa something to bowl at until Watson and Hussey stole the show.